Penguin Stones, give one today. 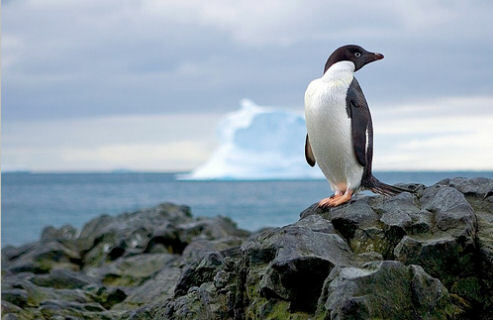 The Adelie penguin is the most common penguin in Antarctica and is the spokes penguin of the penguin species! 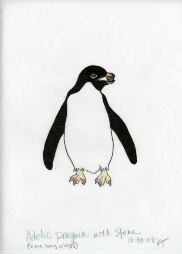 With their black and white tuxedos, the Adelie penguin is what comes to mind when we think of penguins. These penguins were named by Admiral Durmont d'Urville after his wife, Adelie, as a gift demonstrating his love and affection. After a long winter in the Southern Hemisphere, the Adelie penguins make their way to their mating grounds throughout coastal Antarctica. The male and female penguins strut and bray, hoping to attract the attention of another Adelie penguin. When a special penguin catches their eye, the Adelie penguin presents the penguin of their affection with a stone. If the penguin accepts the stone, they start a bond for life. Each new spring, the couples find each other again; and again, a new stone is presented as a token of affection. The penguin pair continues to gather stones for their nest, looking for each precious stone in the frozen ground. Sometimes penguins receive stones from another penguin as a symbol of friendship and caring. Love Friendship Promise Hope Joy Beginnings. Give a Penguin StoneTM today. Penguin Stones, LLC supports and donates a portion of each sale to save the Adelie Penguins habitat and to help prevent global warming. We fully support The Antarctic Treaty of 1959 making it illegal to harm, or in any way interfered with, a penguin, its eggs or habitat. 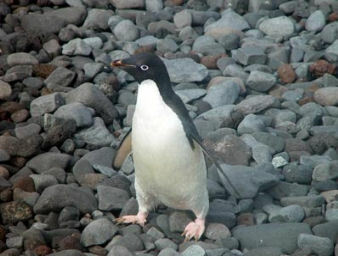 Adelie penguins are the smallest of the penguins living on the Antarctica continent. They are about 28 inches (70 cm) tall and weigh about 8 to 9 lbs. (4 kilogram). These penguins nest and breed on the rocky, ice-free beaches in large colonies of ten thousands of birds. There are over 2.5 million breeding pairs living in the Antarctica region. All 17 species of penguin are legally protected from hunting and egg collecting. The Antarctic Treaty of 1959 makes it illegal to harm, or in any way interfered with, a penguin or its eggs. Every penguin specimen collected with a permit must be approved by and reported to the Scientific Committee for Antarctic Research (SCAR). Our precious Pengiun Stone is delivered to you nestled in the arms of a pop-up Adelie penguin, drawn by nature artist, Kathy Telfer. 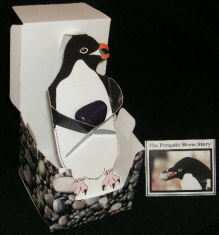 Our Penguin Stone box contains the pop-up Adelie Penguin, our precious Penguin Stone (which size and color will vary) and the Penguin Stone Story ready to share your love and friendship. 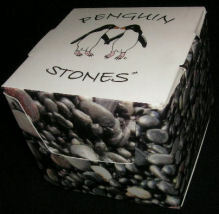 Penguin Stones LLC, All rights reserved and protect under copyright and trademark laws.